After checking your Jamb examination performance, and your score was high, which means that you scored above the cut off marks, the next question is how to pass your Post UTME score. 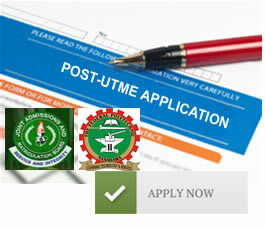 Most Universities in Nigeria sets their institution’s Post UTME from past questions and answers. These Universities prefers and admit students who score higher in their Post UTME to a student who scored high in JAMB. The next step you should take on your journey in getting admitted into tertiary institutions in Nigeria is start preparing for the POST UTME examination. One thing you should note is that getting admission into higher institutions in Nigeria are getting more challenging every year, mainly because all the academic institutions have implemented the post utme entrance examination, which main aim, is to help the school, screen out and select ONLY candidates for their provisional admission. This means candidates who scored high in JAMB and the school’s Post UTME exercise. We have discovered, that some students have come out of the UTME examination with flying colors, but have difficulties with their post utme examinations, thus could not get admission to their desired course of study. Some other students supplement other undesirable courses or institutions. In the previous JAMB examination, we recorded a greater number of secondary students who have scored high, several times in the jamb examination but has failed in their school of choice Post UTME examination, and this automatically means failure in Admission to your school of choice. Today, through the Dailyschoolnews Nigeria educational news broadcasting platform, we want to bring relief to all Nigerian students sitting for this year’s post UTME screening exercise. Below are some tips which will help our readers, students who wish to write and score high in their post UTME examination, to improve their preparatory skills and give them important first-hand information on how to write and pass the Post UTME examination with flying color. Please, read through these important tips to help you to score as high as 300 in the forthcoming post utme exams of your school of choice. Here are what you should do, before the examination. You should take note, that before proceeding into the examination hall, you should have a piece of first-hand basic knowledge about the examination. is my school post UTME exams computer based? Will it be paper and pencil test (PPT)? How is the school setting the examination? How many questions are the minimum questions to answer? How many scores do each question carries? Knowing the answers to the above question will give you a head start, and set you in the right direction. Get Past Questions: I have said this over and over again, students who are preparing for any examination should consider themselves lucky if they can get their hands on a past question and answer book/guide. Having past questions and answer had so many benefits, NOT ONLY will it give you insight into the pattern of the examination, but it will help you to brainstorm the answers to the questions while practicing it and predict the possible questions in the forthcoming examination. Read Consistently: Try reading as much as you can, this is a really welcomed development for any student who wishes to succeed academically. To succeed in your post utme examination, you should try to set a timetable for yourself, at your leisure, and read as much as you can, not only READ, but also try understanding the question, so that when you see it during your post utme examination, you won’t need to spend seconds, before answering the question. Punctuality: You should be at the examination center, before the examination. Try as much as possible to be in the venue before the examination, and give yourself, a stress-free run-up of what you’ve been studying. if you’re traveling a far distance, try getting some rest and take some cool drinks to rest your body and help it recuperate. If your exam location is in another state, try as much as possible to be in the state before the examination. Writing Materials: When going to the examination venue, endeavor to carry along with you, your writing materials. When in the examination hall, you should try as much as possible, to pay attention to instructions. Please make sure, that you do exactly what you are told to do and avoid doing what you are not told to do. I don’t know for you, but as for Me, I always choose to ask for guidance from My Creator, Jesus Christ of Nazareth. You should try as much as possible, to know the timing of the examination. You should check the time which is allotted for the examination and compare it with the number of questions you’re given. Time yourself during the examination: Timing yourself while in the exam hall is very paramount. This means that, if you are answering 100 questions for 1 hour, you have to calculate the time you should spend on each question. AS we all know, there are 60 minutes in 1 hour, so you have to optimize it well, so as to answer the 100 questions correctly. As we all know, the post UTME examination is also called an aptitude test. Aptitude test is meant to test your common reasoning. POST UTME questions are very simple questions. You should read through each question carefully and attempt to answer them correctly. I hope that through the above guidelines, you should be able, to pass the examination with flying colors.